Am I the only one suffering from Apprentice burnout? After two seasons of having a hoot and a holler engaging in corporate voyeurism every Thursday, I entered this season feeling spent, used, tired of the whole thing (or did my malaise really take hold during last season’s dismal three-hour finale?). Had no interest in watching last Thursday. No matter. I woke up Friday morning, heard about Danny Kastner‘s "performance" the night before, and thought about getting back involved. But then I got the press release publicizing this week’s show, and I began to get that queasy, too-much-hype feeling. (The two teams will be asked to renovate decrepit Jersey Shore motels, with customers rating them—product placement advisory!—on Yahoo! Local to determine the winner.) 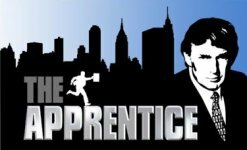 Here’s a quote from the release: "One candidate caves under the stress and walks off the show during an emotional and poignant episode of NBC’s The Apprentice … Yahoo!’s new local search product—Yahoo! Local—is featured during the task, and billionaire Steve Forbes shows up in a surprise appearance." There oughtta be a law against the words Steve Forbes and poignant appearing in the same paragraph. I just don’t know if I can bring myself to watch.